Some concepts in English are clearer than others, and some are more clear when told in a different manner. Isn’t it? While Microsoft word doesn’t like the word ‘more clear’ and doesn’t accept it without the blue lines, it is perfectly fine to use ‘more clear’ in some contexts. In this grammar.com article, let us see how both clearer and more clear make sense and can be used for perfectly valid sentences. When something is understandable or transparent, we say it is clear. Some examples would be – ‘The water is crystal clear’¸ The concept is ‘clear’. · The sky is clearer today than yesterday because it rained. · Thanks to your notes, I am clearer with the concepts now than I was before. · Rain water is clearer than the tap water that you brought. Even though clear has only one syllable, the word ‘more clear’ is in usage for a long time now, and though we don’t know how it came into existence, as of today, it is perfectly valid. You can always replace clearer in all the above examples with more clear. · The sky is more clear today than it was yesterday because of the rains. · Thanks to your notes, I am more clear with the concepts now than I was before. · Rain water is more clear than the tap water that you brought. You may not be totally convinced with this replacement, but it is grammatically correct. Also, even if you are not fully satisfied, read the second example, you might feel much better. In the second example, the usage of ‘more clear’ looks perfectly appropriate. This could be because the sentence has a more formal tone. · To be more clear, I would like to present a case on this topic to the audience today. · We would want to be more clear with the terms and conditions before signing the contract. Open the windows so that I can see clearly. Open the windows so that I can see more clearly. Here, both the sentences are correct. I want to make my purpose more clear. I want to make my purpose more clearly. See the difference in both sentences. The second sentence is grammatically incorrect. If we replace the word make with “express”, the second sentence would be correct while the first one will become incorrect. I want to express my purpose more clear. I want to express my purpose more clearly. Similarly – how to talk more clearly in front of others? And not – how to talk more clear in front of others? Clearer is already a comparative form, more is also used for comparative. It is meaningless to use two comparatives at the same time. Hence, it is incorrect to say “more clearer”. Clearly, clearer is more clear in terms of the natural choice based on the syllable rule of grammar. However, we can use ‘more clear’ as well, especially for formal tones or talks, which is perfectly fine! 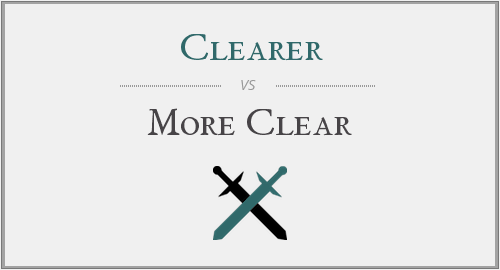 "Clearer vs. More Clear." Grammar.com. STANDS4 LLC, 2019. Web. 22 Apr. 2019. <https://www.grammar.com/clearer_vs._more_clear>.